I often get asked, "How do you decide what to make?" For me, the answer is, "It depends!" Often, I start with a focal bead from my collection. From there, I browse my bead boxes for beads that either go with the color/style of the focal, or that complement it in some way. I pull a few of this bead and that, until I have quite a melange selected. One of the things that often happens to me is that I don't end up with enough contrast in my first bead selection. At that point, I pick a color or two that provides good contrast with the focal bead and the color way I've pulled, and add some contrasting beads. Another element to consider at that point is metal bead additions, or not! What color and type of metal beads are harmonious with the palette I've pulled (and, how expensive do I want this piece to be, if i'm wanting to use sterling silver, for instance). Then I look over the set of beads I've pulled and see if it satisfies me or not. All of these little decisions are part of the artistic process, and result in a collection of materials that is unique to me. 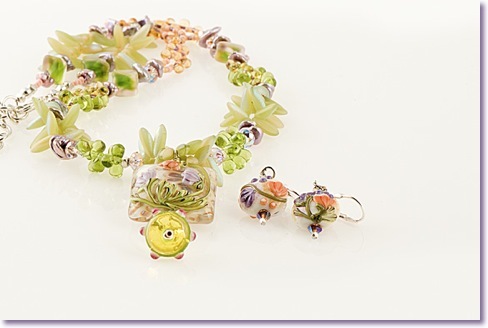 In the piece below, I began with the lovely glass pillow bead as the focal for the piece. I wanted to bring out the green as a predominant color, as well as the light purple and tangerine from the bead' flower design. I added the soft green dagger beads to continue with the botanical motif- using them as "leaves." This piece was purchased at my last show! I'll be writing about other sources of inspiration along the way. Stay tuned!